Being a military spouse is like a full-time job without benefits, and no pay. You may find it difficult to maintain a professional career. As you’ve probably figured out, the military wants a lot from you. For instance, you must be able to adapt to drastic change as moving from place to place is expected. However, thanks to military spouse networking, you can still build a professional career despite an unpredictable lifestyle. Without professional relationships, you won’t go far. 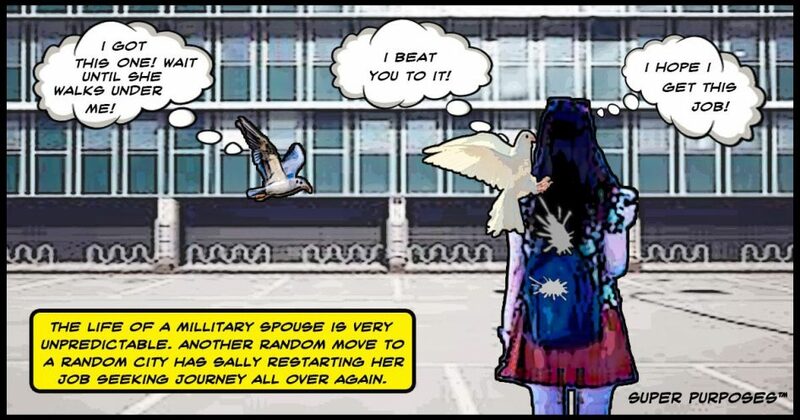 Unfortunately, maintaining professional relationships can be a struggle for a military spouse. This is why military spouse networking is important for a successful career. By developing good networking skills, you can build professional relationships despite the setbacks that come with being a part of the military. Imagine the corporate workplace as a land of paradise surrounded by an ocean of man-eating sharks. Military spouse networking acts as a bridge that helps you cross the water safely. So what’s military spouse networking? Simply put, it provides a way to build professional relationships despite the struggles that come with being a military spouse. Also, It’s important to note: no one is an island, and you shouldn’t aspire to be. Why choose to be a small island in the middle of nowhere when you can create a country of happy citizens? Keep this in mind, no piece of land becomes a country on its own. It takes a community of people to make any country great. So in order to further your career, you’ll need people to help you along the way. As a military spouse, developing professional relationships can be difficult. Relocating puts you in unfamiliar places with complete strangers. For this reason, you may find yourself in a position where you’re constantly starting from scratch. To make matters worse, it’s likely you may not live in a place with a local job center nearby. So what do you do? Turn to social media. Through online platforms, you can find an audience of like-minded individuals who hold the same passions as you. Military spouse networking is easy through online platforms, such as LinkedIn. These online platforms are specifically designed to create pathways where you can interact with people. You’ll be like a spider building a web. Using one person as a link can put you into contact with another and so on. Before you know it, you’ll have an entire community of people to work with. No longer do you have to worry about where you live when job searching. Through social media, you can communicate with anyone around the world from the comfort of your own home. In addition to social media networks, use other platforms to build professional relationships. Blogs, listservs, newsgroups, and internet forums are great for military spouse networking. Through these online platforms, you’ll learn more about your career field and find specific job openings that aren’t known to the public. Online groups are popular places for military spouse networking. You can use social media platforms to start or join professional groups. For example, Virtforce has a popular group on Facebook that specializes in military spouse networking. Also, there are networking groups specifically made for military spouses outside of social media platforms. Groups like the National Military Spouse Network and Military Spouse Corporate Careers Network are great places to join for military spouse networking. You don’t have to solely rely on the internet to build professional relationships. Besides, meeting people online isn’t the same as meeting them in person. You can find professional events that can be beneficial. For example, find local organizations or start groups within your community. Using a site like meetup.com can help you find people with similar career interests and passions. On this website, groups are formed based on career type and experience level. However, if you don’t find a group that fits your interests, you can start your own. Volunteering is an opportunity to meet people. By volunteering for causes that you connect with, you can meet people with similar interests. Likewise, volunteering is a way to gain experience in your career field. It’s like hitting two birds with one stone. Being a part of the military does have its perks. For instance, you’re provided a community of people to build business relationships with. So take advantage of the career centers and spouse groups within the military community. Military spouse networking works well if you know yourself. So don’t allow the role of ‘military spouse’ to define who you are. Even though you’re a military spouse, remember you’re more than that. Once you do, portray this part of yourself when building your professional relationships. In a nutshell, military spouse networking is simply meeting people and starting conversations. So don’t be afraid to reach out when you can. Being a military spouse may feel like a job, but you don’t have to make a career out of being one. Prioritize marketing yourself professionally in your career field. The best way to build your military spouse networking skills is through communication. Military spouse networking is an important skill. So step outside your comfort zone as you cannot be a one-person army in the corporate world. Understand that a community of people with similar values as your own is beneficial. With a group of like-minded people, you can go far in your career field. By having a team, you can gain job experience and establish connections that can help further your career. To learn more about military spouse networking, attend the free webinar at Super Purposes™. There, you’ll be shown how to market yourself in the corporate world despite your struggles as a military spouse. Check out this article by Gabriella Lobianco, where she explains how to build your personal brand as a military spouse.